I went to a garage sale today. The quilter had just moved to assisted living. The daughter handed me a grocery bag and said $2.00 a bag. I filled two bags and picked out three books and spent a grand total of $5.00. There is a total of 56 yards of quilt shop quality. I felt a little guilt until the guy working said, jokingly I think, If I came back at 3 he would give me my money back if I took everything that was left. I told him, my hubby would never let that happen. LOL! CHA-Ching you hit the jackpot! I love having extra fabric to play with. The inexpensive but good quality fabric frees me up to explore and indulge my creative urges. Have fun!! Don't feel guilty. At least they were selling her stash (oh, OK, practically giving it away) instead of throwing it all out. I'm sure she'd rather have it going to someone who is going to use it than have it in the landfill. And now you get to think of all the possibilities in that stash. What fun. I'd definately go back. If it's something (leftovers) you can't use, you can pass them on to someone that can. We spent this morning going to garage sales looking for fabric.......only found a small sack of scraps. Will try again tomorrow! You really scored!! Score!! I need to go to more garage sales... Well I do hit the sales, but they don't ever have quilting stuff there... Oh well- someday I'll get lucky and score!! 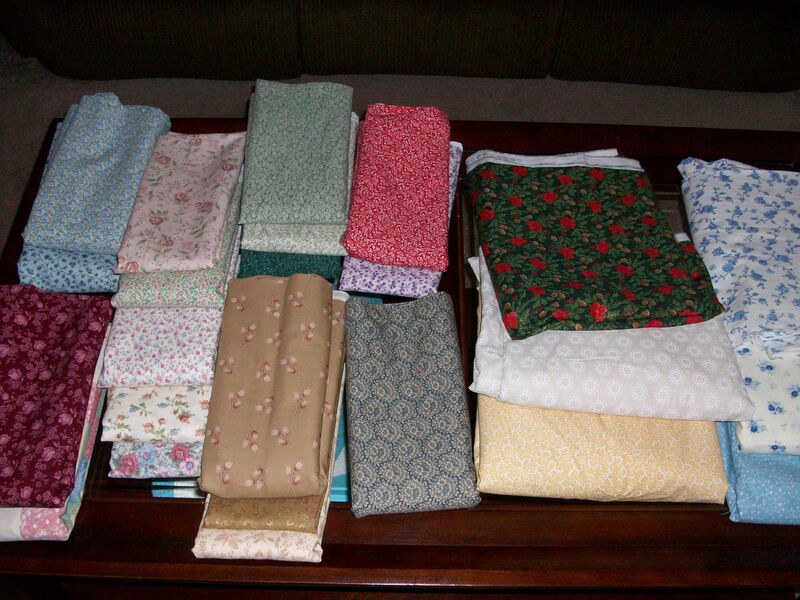 Your not a hoarder if you use the fabric (someday) lol, I will use it I know I will, I know I will. How nice - you really got a good deal! Enjoy your new stash! you are only a hoarder if you will not use or part with any of the fabrics you pick up- if you use them & on occasion part with some you are not a hoarder- just a quilter. I'm in Indiana. Where is this place???????????? It is an garage/moving sale in Portage. WOW you are the lucky one. These kind of posts remind me I need to sew faster. I want to use up my stash. You were very restrained. I would have loaded the truck and taken it all and then I would have had a lot of fun sharing with my quilt buddies at guild. I would do this too. Or you can ask for what you paid for it so you aren't out any money and they share in the loot. Knowing I have other quilters will to share the price, means no hesitation next time. I would have said "Here's $$ and I'll take it all now" I have a Jeep Grand Cherokee and I can get a lot in it. My kind of shopping. You are not a hoarder. I know I am a fabric hoarder...isn't it fantastic? I can't get enough fabric and love to find it at sales. I really am hoping I will stop buying and keep sewing for a few months...I don't think I have enough time to use all I have but I love to get all wrapped up in it. Don't feel guilty! He made the offer, you didn't initiate it.